Keep reading this article on NFL Gridiron Gab. 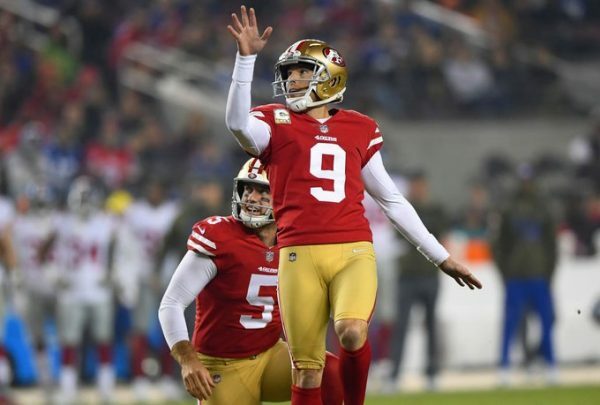 Things appear to be at a complete stalemate for the 49ers and kicker Robbie Gould, and now the former Bears kicker wants to be traded. According to Adam Schefter at ESPN, the veteran kicker told San Francisco that he would not sign a long-term deal and wants to be traded so he can be closer to his wife and kids in Chicago. Gould is the Bears all-time leading scorer but was released by the team before the 2016 regular season. It sounds like this is going to drag on for sometime before anything comes of it, but for now the Niners are a team without a kicker. The Steelers are working hard to extend quarterback Ben Roethlisberger prior to the draft on Thursday, Adam Schefter of ESPN.com reports (Twitter link). Big Ben has one year left on his current deal, but the club wants to keep him “well beyond” the 2019 season. We recently heard that Roethlisberger was not necessarily pushing for a new contract, but that talks between player and team were ongoing. 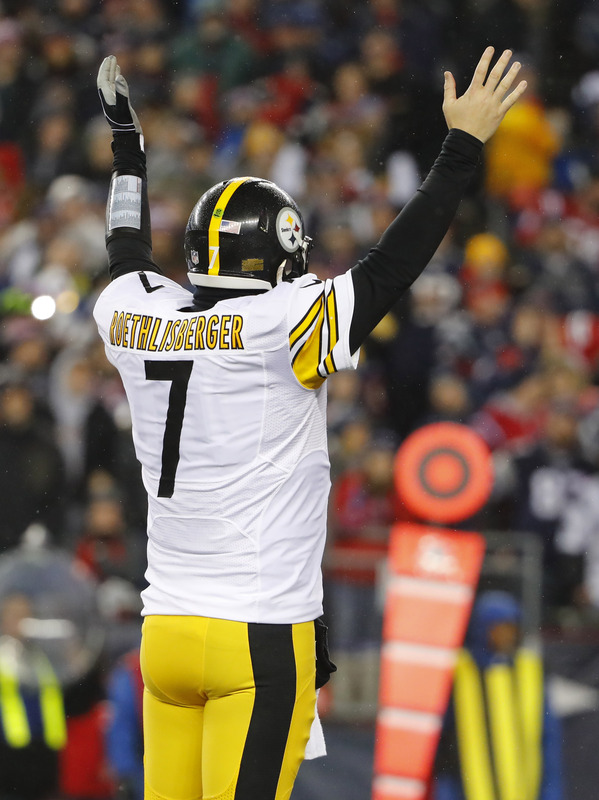 The two sides have been discussing a re-up at least since January, and given that Roethlisberger could earn upwards of $60MM in the 2020-21 campaigns if the team used the franchise tag on him, that figure could be a primary benchmark in negotiations. Check out the entire 1st round prediction, and who the Steelers bring home, in the latest mock draft. Every year everyone here at SB Nation goes through a bloggers NFL Mock Draft. There was a time we did multiple rounds, but it has been trimmed down to just the first round. Each editor, or someone designated to represent their website, makes the pick for their team, and in the 2019 mock draft I chose CB Byron Murphy for the Pittsburgh Steelers. In case you were wondering, many, if not all, of the headline names floating around the black-and-gold fan base were off the board before my selection. I chose to go cornerback over wide receiver, and I like Murphy over Greedy Williams and Deandre Baker. Hartman: The Pittsburgh Steelers make this selection looking at the future. While the fan base will bemoan the selection, Murphy will be a player who can play sparingly in Year 1, before taking over for the aging Joe Haden. Murphy is young, and declared for the draft after a stellar sophomore season saw him total 58 tackles, 13 pass defenses, four interceptions, and a touchdown. Murphy will bring versatility in being able to play both man and zone schemes, and could be a valuable commodity in some shape or form as a rookie. The Steelers know their secondary needs to improve to match their pass rush — which was tied for the most sacks in the NFL last season — and the pick of Murphy is a big step in the right direction. Analysis: It took all of 20 games of college football for Murphy to decide he was ready for the NFL. He made the right decision. Murphy may not be a press specialist, but that is one of his few flaws. He can help the reshaping of Pittsburgh’s secondary that started this offseason with the signing of free agent Steven Nelson. A combination of Nelson and Murphy would give Pittsburgh a viable partnership on the outside for several seasons. That’s good considering former first-round pick Artie Burns has been a letdown and Haden has just a season left on his deal. The best part about this mock draft is we did something unique this year. We decided to create a podcast with all of the bloggers stating their pick, and why. It is a really unique feature, and one I encourage everyone to check out! Everyone has an opinion on who the Steelers will select this Thursday with the 20th pick of the 2019 NFL Draft. In fact, so many people have so many varying opinions, I have no idea what to believe. I’d like to say it was different this year in Steelers draft land. However, it’s like any other year—everyone has an opinion on who Pittsburgh will take, and that opinion is a fact. As for me, I have no idea who the Steelers will select this coming Thursday with the 20th pick of the 2019 NFL Draft. Oh sure, I have a new gut feeling to replace my old gut feeling: Clelin Ferrell, defensive end, Clemson. Why do I have that new gut feeling, the one that replaced the old gut feeling of Deandre Baker, cornerback, Georgia? It just seems like more and more fans are warming up to Ferrell. But what is he? He’s listed as a defensive end, of course. However, at 264 pounds, he’d presumably have to switch to outside linebacker if he came to Pittsburgh. And since the Steelers have three really good starters on the defensive line in Cameron Heyward, Stephon Tuitt and Javon Hargrave, that’s a pretty safe presumption. When you think about it, it makes sense. Considering the Steelers have been linked to outside linebacker Chase Winovich of Michigan and Jefferson Hills, Pa. fame, why not just upgrade to Ferrell as a means to finding a possible replacement for Bud Dupree–assuming Dupree doesn’t suddenly “get it” in his fifth season? Why did my gut feeling about Baker change? I don’t know, only that it’s so hard to get a real gauge on who is worthy of Pittsburgh’s first-round draft pick, and who is just a total reach. It’s also hard to gauge who among the draft analysts knows what he or she is talking about, and who has the football IQ of a gnat. I fully admit to having the football IQ of a gnat (at least Facebook thinks so). Therefore, I tend to defer to the ones who seem to know what they’re talking about—at least when it comes to the draft. But is that person Mel Kiper and his ilk? Could it be someone who has the word “Steeler” in his or her BTSC name? Maybe it’s some guy on Facebook who coaches high school kids. It’s hard to say. All I know is they all say the others are full of it when it comes to draft evaluation. Many have mocked Greedy Williams, Byron Murphy and Baker to the Steelers at number 20. But others have said this is the weakest crop of corners in years. Is it really that weak? Should I listen to Mel, Steeler4Life or the high school coach? Two years ago, the thought of the Steelers drafting a quarterback—Ben Roethlisberger’s eventual replacement—was all the rage. Today, it seems taboo to even suggest it, what with Roethlisberger about to sign an extension. Have the Steelers done enough in free agency to really go BPA (Best Player Available), or should they seriously focus on trying to trade up for an inside linebacker? And if they do decide to go the trade route, how much draft capital is LSU’s Devin White worth? How about Michigan’s Devin Bush? Some say Pittsburgh, with 10 draft picks, should absolutely explore the option of trading up. Others say the cost would just be too great. In conclusion, everyone has an opinion on what the Steelers should do on Thursday. Someone is going to be right. Someone is going to be wrong. Someone is sure to be angry (“Wait a minute. I had him rated 97th on my kitchen draft board!”). As for me, I just hope my gut is right. Why? I base it on nothing tangible. Even if I’m wrong, hey, what do I know? Longtime Carolina Panthers running back Jonathan Stewart has signed a one-day contract to retire as a member of the Panthers. The first two days of the draft are players who almost always make the 53-man roster, but finding day three players who can contribute is just as valuable. The first round of the NFL draft is only a few days away! Many NFL fans will tune in to the primetime spectacle on both Thursday and Friday to see what players are taken to help shape their favorite team for the 2019 season. But many times it’s the players taken on the third day in rounds four through seven that can really affect the teams immediate depth. For example, only four draft picks over the last three seasons for the Pittsburgh Steelers are not still currently on the roster. Beyond those years (2015 and earlier), the Steelers have no more than two players from any draft who are available for them going into 2019 (since Ryan Shazier announced he will not be able to return next season). To put it in numbers, 82% of the players drafted by the Steelers the last three seasons (2016-2018) are still under contract while only 23% of the Steelers draft picks from 2013–2015 are still in black and gold. So the 2019 selections are all important to the Steelers regardless of round. Even though many fans tune out of the final round of the draft, it is the diamonds in the rough from the late rounds who can really make a difference on the team. Here are some of the most notable picks in rounds four through seven since Mike Tomlin has taken over as head coach of the Steelers in 2007. Rather than just outline all the hits, each round will consist of a high value pick, a good value pick, and a low value pick (a much nicer way to say “bust”). Although he had his troubles and missed many games due to multiple suspensions, Bryant did have great numbers for a fourth round pick. In 36 games, Bryant had 17 receiving touchdowns on 126 receptions for 1917 yards. Surprisingly, the fourth round of the draft has produced the least amount of high value players for the Steelers over the last 12 seasons. Although the value Landry Jones brought the Steelers was highly debatable within Steelers Nation, he spent five seasons with the team with three of them serving as the back-up quarterback. In that time, Jones started five games and had a 3–2 record with eight touchdowns and seven interceptions. Gibson made the 53-man roster for the Steelers after being drafted in the fourth round out of Ohio State in 2010. Inactive for the first six weeks of the season, Gibson was released in order to make room for another defensive lineman (Steve McClendon) due to the injury of Aaron Smith. The Steelers were not able to get Gibson on to the practice squad as he was claimed off waivers by the San Francisco 49ers, but only appeared in two games. Although he spent one season with the Arizona Cardinals in the middle of his career, Gay had two different five-year stretches with the Steelers. He appeared in all 116 regular season games in which he was under contract with the Steelers, ranking him 29th all time in franchise history. His 5 interceptions returned for touchdowns as a Steeler is tied with Rod Woodson for the all-time mark. I personally think James is close to the high value range. Out of Penn State, James appeared in 56 games for the Steelers as their number two tight end. James turned his 120 receptions for 1,189 yards and nine touchdowns into a very lucrative deal with the Detroit Lions for the 2019 season. Drafted in the fifth round out of Rutgers, Stevenson failed to make the 53-man roster and landed on the Packers practice squad.After dealing with an injury, he spent three seasons bouncing around on the practice squad of several NFL teams before going on to play in the UFL and AFL. Of course Antonio Brown is one of the best six round picks in NFL history with seven Pro Bowls and four All Pro selections. But Vince Williams has also been a great value pick for a sixth-rounder. Appearing in all but three games since he was drafted, Williams has started 47 games and has over 300 tackles. In his four years with Pittsburgh, Mundy was a core special team player and spot starter. With one interception and two fumble recoveries while in Pittsburgh, Mundy did go on to have a successful year in Chicago with four INT‘s, a touchdown, and over a hundred tackles. While many Steeler fans were puzzled at selecting a long snapper during the draft, it appeared that the team had a plan in place when Greg Warren was forced to retire due to injury. But Holba couldn’t win the job in camp, and now is only known for winning the team’s home run derby in Latrobe. At pick 248 in the NFL draft, Kelvin Beachum is tied with Keon Adams (2017) as the lowest draft pick the Steelers have taken since 1992. Considered a project out of SMU, Beachum started the last 5 games of his rookie season. He went on to start 39 total games for the Steelers before injuring his knee part way through the 2015 season. Since departing from Pittsburgh after the emergence of Alejandro Villanueva, Beachum has been a full-time starter for the last three seasons for both the Jaguars and Jets. Like him or not, Matakevich is exactly what a team would hope to get out of a seventh round draft pick. Locked into the back-up linebacker roll, Dirty Red is a core special teams player who has only been inactive for one game in his three-year career. The first player of the Steelers have drafted out of Alabama since to Deshae Townsend in 1998, Frazier was a player the Steelers hoped could take the back-up nose tackle job from Daniel McCullers. It also helped that his college position coach had just come on board with the Steelers. Unfortunately, Frazier didn’t even impress enough to make the practice squad. One of most frequently mocked players to the Steelers this offseason, Byron Murphy tested out what he would look like in the Black Gold on his Instagram account. If the mock draft experts are to be believed, the Pittsburgh Steelers first-round selection in 2019 will be between Devin Bush, Greedy Williams and Byron Murphy, with the Washington cornerback one of the more popular names to project to the Steelers this offseason. While the connections to the player are obvious given his trip to Pittsburgh as a pre-draft visitor and the team’s clear need at the position, it would appear that Murphy is also warming to the idea as well. With the draft just a few days away, it seems the Washington product is already dreaming about what it might be like to wear the Black and Gold, posting a picture of himself in a Steelers uniform on his Instagram account on Monday night. Unless Murphy knows something the rest of us don’t, sharing an image of himself in Pittsburgh colors just days before the draft is a bold move for a player who could yet end up one of their rivals. Generally considered the best cornerback prospect available this year by most experts, along with Williams of LSU, Murphy would provide a notable upgrade to the list of talent the Steelers currently have at the position and might be the safest choice in the first-round if Bush is already off the board. Kevin Colbert discusses the ever important debate: To trade, or not to trade for the Steelers? GM Kevin Colbert addressed the notion of moving up or down in the 2019 draft. In the Steelers pre-draft press conference on Monday, General Manager Kevin Colbert addressed the issue of moving around in the 2019 NFL draft. To sum up his thoughts, Colbert explained when a draft trade would take place. Colbert went on to explain the process for the Steelers making their selection at #20 and if they want to stay put. As for what it would take to trade down in the draft, Colbert explained what would happen to keep their pick. As for determining what value it would take to trade up or what the Steelers would want in return for trading down, Colbert explained why they don’t always go along with what most teams believe. If you were to read between the lines of what Kevin Colbert was saying about using chart values, the Steelers are aware of what it would take to trade into certain positions. It appears the Steelers plan to use that knowledge along with what they would be willing to give up in a trade in order to determine when they can be serious about making the move if the right player is available. Colbert also addressed the issue of moving in the second or third round. Colbert also explained how he values picks which could be used to package a deal. Whether or not the Steelers make a move on draft night remains to be seen. With ten selections, the Steelers have the assets in 2019 to attempt to move around at some point over the course of the seven rounds if the right situation presents itself. Author Dave.SchofieldPosted on April 23, 2019 April 23, 2019 Categories Pittsburgh SteelersLeave a comment on Kevin Colbert discusses the ever important debate: To trade, or not to trade for the Steelers? Remember wide out Antonio Bryant?